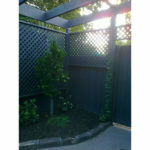 Merbau is the most common hardwood species used in screening projects across Melbourne. It is known for its exceptional reddish- brown complexion and great durability outdoors. 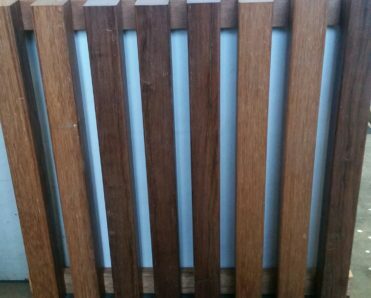 We recommend sealing and staining over the panels to ensure maximal longevity of the timber and to maintain its rich appearance. We manufacture these panels in a jig with a 25mm space in between 42mm battens, with the battens screwed from behind so no fixings are visible from the front. This is a great profile to use when you feel that the 42mm X 19mm battens are going to be too thin for your project and you prefer a more solid look. Similar to the other batten screening profile this look will provide no visibility when looking at the screening profile on an angle as opposed to looking at the screens front on. 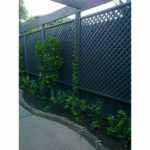 If you are after more privacy then running shade-cloth behind the screens is a great way to achieve more of a block out screening solution. 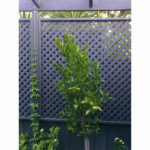 This battens screening profile is commonly used around decks, pergolas or carports as well as front fences. 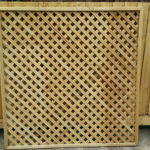 We are able to custom make panels to suit your requirements making it easier for you and saving you time and money. Lead time for us to make these panels up will depend on how busy we are and how many panels you are after. Best to get in touch with us and we can advise a lead time for you. These hardwood extensions are an imported product. The table below giving a rough indication of lead time is applicable only if we have panels in stock and just need to leg them. Please contact us if you are interested in having the panels installed and we can put you in touch with someone to help with your job.